2015 August 5, corrected and added additional house corner radius dimensions to top view. 2012 November 17, gridded armor drawing removed to its own page. 2012 April 8, images updated, page revised, and detail images added. 2012 April 6, images updated. 2012 April 1, images updated. 2012 March 23, page added. Previous chart house page removed. 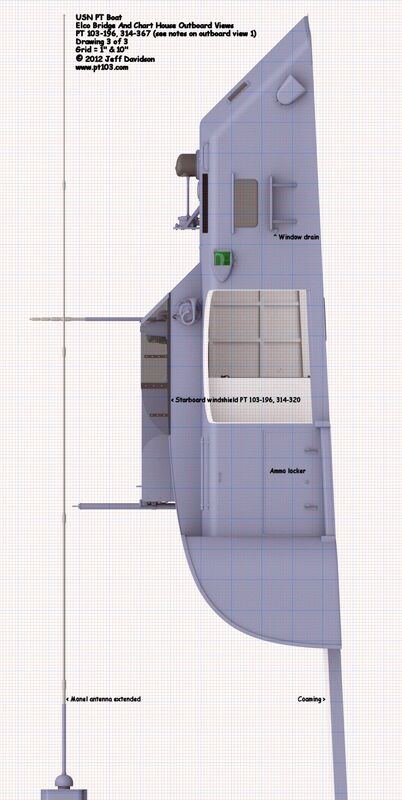 The following images show dimensions and placement for an Elco 80' PT boat bridge and chart house, in particular for an early 103 class. These dimensional images represent a best effort on my part, please confirm dimensions given here for yourself if errors cannot be tolerated. Images are for non-commercial personal use only, please obtain permission for any other use. 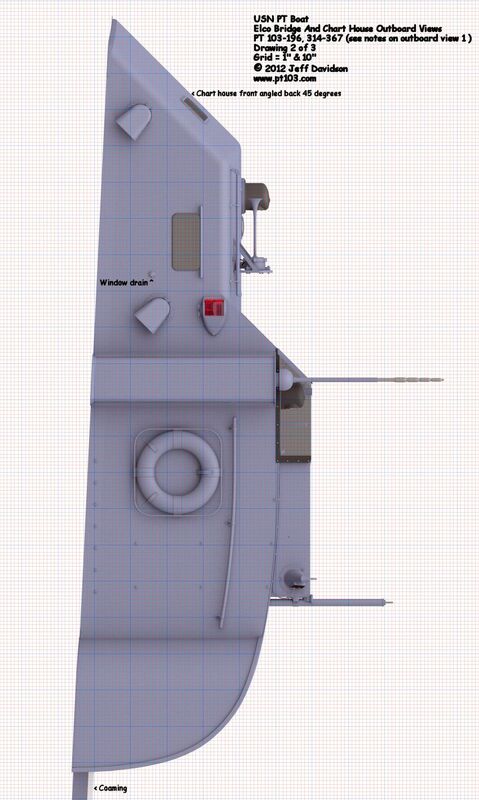 NOTE: The Detail Specifications are based on Specifications for Motor Torpedo Boats PT 103 to 138 design No. 80-N-3 (dated 2 January 1942) and addenda thereto (dated 22 February 1943), as prepared by Electric Boat Company, Elco Naval Division, Bayonne, N. J., with the minimum modifications made by the Bureau of Ships to make the hull specifications applicable to PT 565-624 Class. 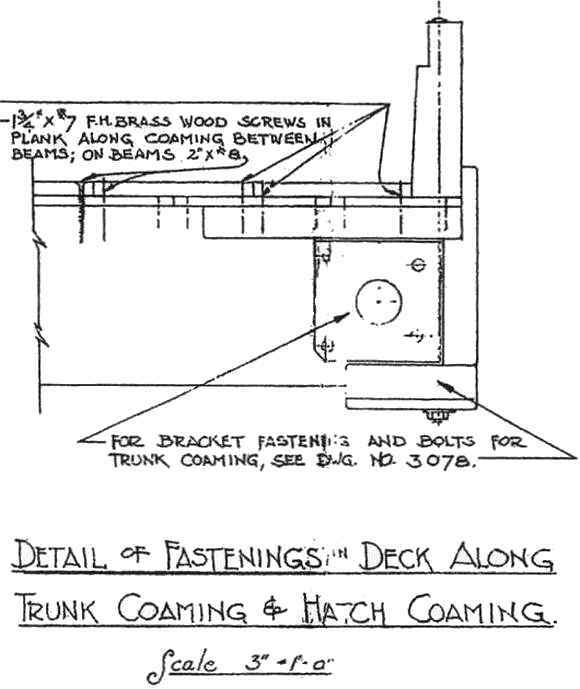 Detail Specifications For Building Motor Torpedo Boats, March 1944, provides the builders specifications for PT 565-624. Floor bearers of spruce constitute a part of the framing system, and shall be sided to match the bottom frames, and connected thereto with 5/16 inch plywood gussets, glued and fastened with wood screws. 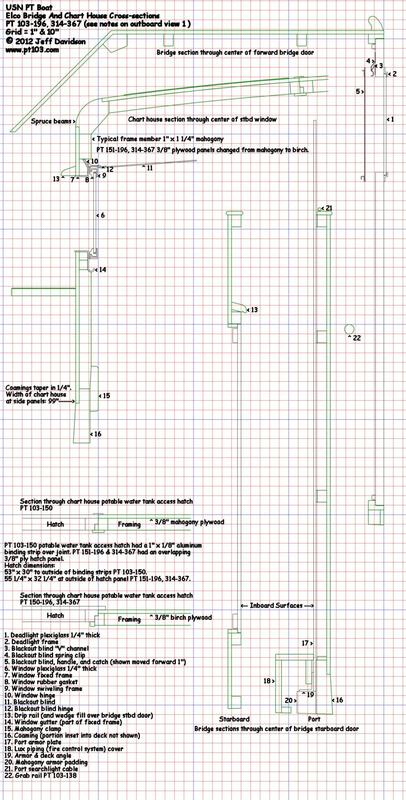 Horizontal bearers and keel posts to be 4 inches molded, with 3 inch diagonal braces on alternate frames in crew's quarters as per plan. Flooring, except in tank compartment and chart house, shall be balsa-core aluminum covered panels having all edges sealed against moisture. Spacers of mahogany shall be fitted to permit easy and complete access to bilges. Flooring of chart house shall be of 5/8 inch fir plywood, with mahogany bearers, well fastened to longitudinal bulkhead and with headers as required. Continuous full-length coaming 1 3/4 inches to 1 1/2 by 6 inches and deck shelf 1 1/8 by 9 inches mahogany, shall be through bolted to subshelf below deck beams. Superstructure shall be of simple form, all straight sided and plumb, except the raked and angled forward end of radio house and bridge shelter. 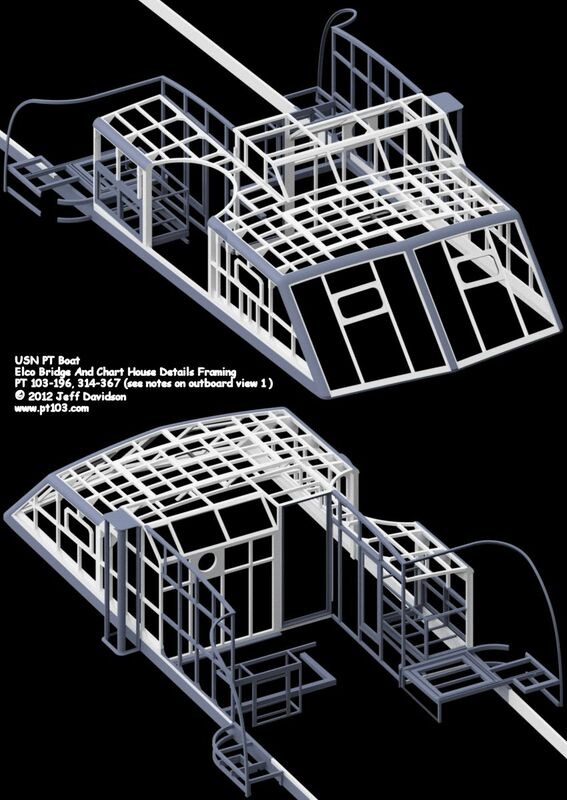 The trunk above crew's dayroom shall be built with framed-up plywood side and ends, and top only being removable, to permit unshipping fuel tanks. Any tank may be unshipped independent of the other two. Top shall be molded plastic or fabricated plywood, covered with aeroplane fabric, doped on, and is provided with means of securely bolting to sides and making watertight transverse joints. It is unnecessary to dismantle turrets in removing either engine or tank hatches. The radio and chart house shall be constructed in general the same as the after trunk, but shall have permanently fixed top. Machine gun turret cylinders shall be 48 inches 0. D. and be located as per plan and constructed of molded plastic plywood, with special connections to after trunk and chart house. Top shall be designed to carry government furnished scarf ring gun mount for twin .50 cal. machine guns. Scuppers to deck at low point of base. Firing steps for depressed fire shall be fitted. House tops shall have heat insulation of Onazote or equal to within about 8 inches of house sides. Bridge arrangement shall be in accordance with Motor Torpedo Boat PT486 type arrangement. Aperture for sighting radar scope to be provided to starboard of the throttle location, as approved. Throttles to be located to starboard of the steering wheel. A wind deflecting airfoil shall be installed over and slightly forward of the steering station. Watertight doors shall be fabricated of aluminum and plywood, with rubber gaskets and specially designed hinges and quick-operating dogs, located as per plan. All ports shall be of special type with improved drain pans and scuppers, except in crew's dayroom and chart house sides which shall be fitted with hinged metal ports with integral black-out shutters and equipped with wire mesh insect screens satisfactory to the Supervisor of Shipbuilding. Eliminate windows from forward side of chart house. Portable insect screens shall be provided to protect all living spaces. Black-out shutters shall be provided throughout boat, including screens for fixed and hinged windows and ventilators. 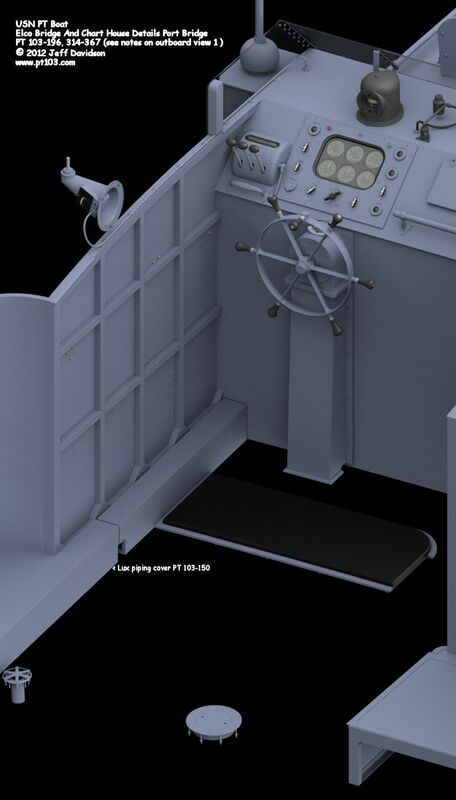 Screens shall be of solid plywood type, sliding in runners for windows, and under engine room vents, to be combined with spray shields, fitted with drains to deck. Special metal shutter shall be fitted on chart house door. Boots shall be fitted at muffler operating rods at transom. Areas reflecting light near shielded openings shall be painted flat black. 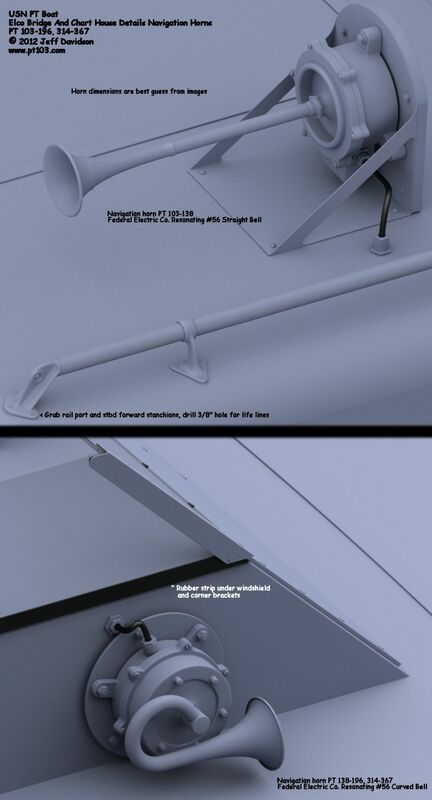 W-1-l. Radio and chart house.-Shall be located forward of the bridge and reached therefrom by a door with fixed window and clamping dog handle bolted on inside. The deck level shall extend inside the chart house on the sides and forward, to form a continuous working table surrounding the floor space. To star board aft there shall be a .50 cal. 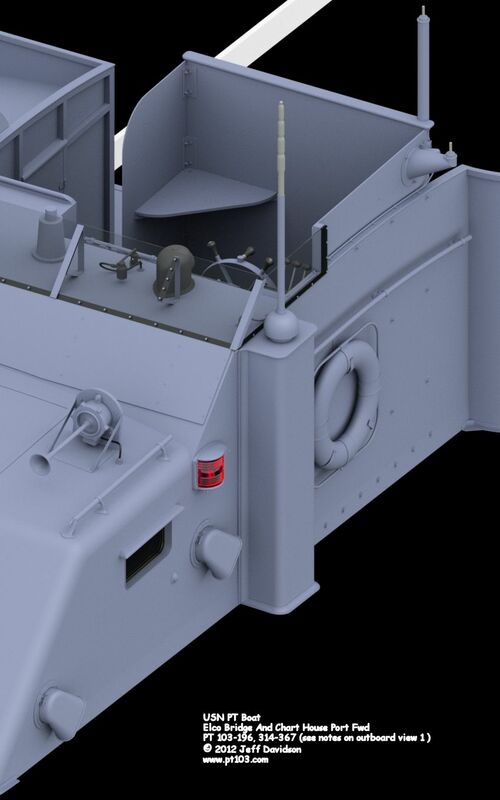 ammunition locker, opening on deck, but having racks for sub-machine guns on its interior sides. The forward table space shall be reserved for navigation, and navigational equipment, also bookshelf, chart space, and transverse drawers which extend forward to the front of the house itself, having a tray top just under the forward house windows which shall be of fixed type. 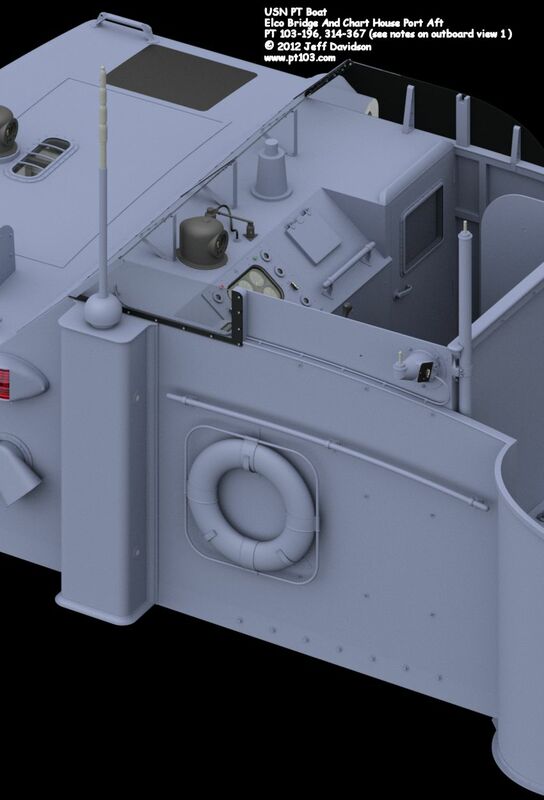 The port side shall be reserved for all radio and detecting equipment, including a chair against the after bulkhead for the operator. 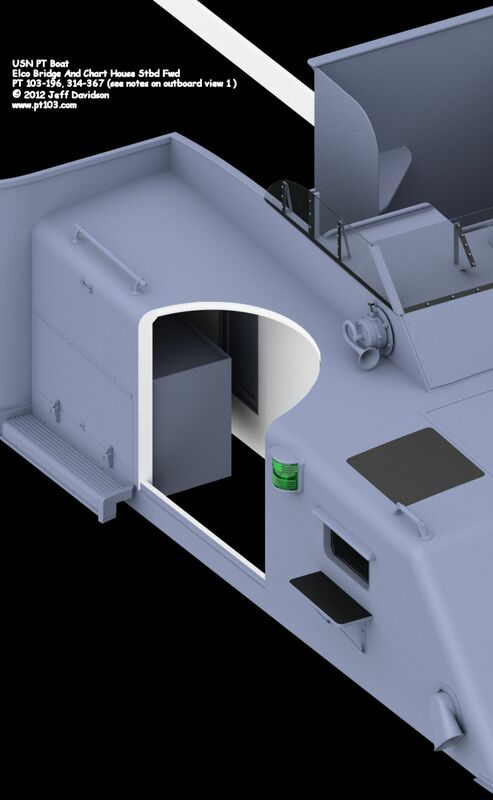 The floor space just forward of the entrance door shall be cut out and hinged as hatch cover, so that the ladder on the bulkhead may extend below the floor and provide a descent to the main floor level below, between the officer's mess and the officer's lavatory partition. 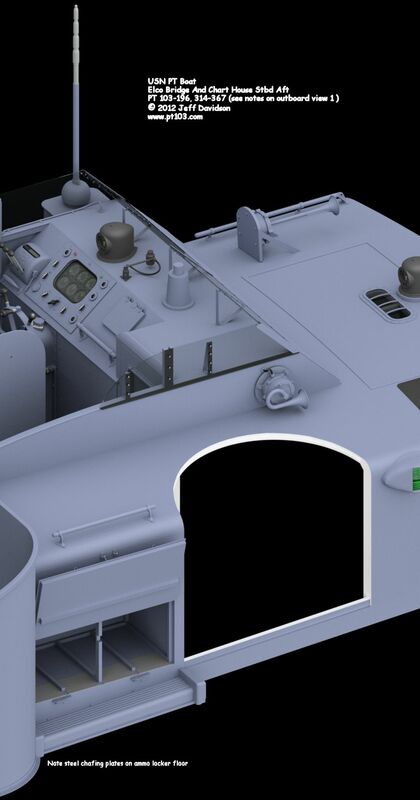 The remaining space under the chart room floor, being of low headroom, shall contain the 200-gallon water tank on the forward bulkhead, and the two carbon dioxide tanks for the fire extinguishing system on the after bulkhead. A removable section of flooring between these tanks shall afford access to the bilge. An open arch to starboard shall provide entry to the main passage fore and aft in the boat. The flooring in the chart house shall be mechanically portable, also a section of the chart house roof, approximately 30 by 54 inches for removal of the potable water tank described above. The flooring shall be fitted for a mat of sponge rubber with ribbed tread. One voice tube shall be installed from bridge (cockpit) to Radar control station. No calls.